First ensure that the Designer chooses a system which is well recognised in the building industry and has all the relevant certification and check what Warranties/Guarantees will be provided by the manufacturer, supplier and installation contractor once the work has been completed. Don’t forget to make sure that you have a written contract with your Designer and that he has Insurance should he incorrectly advise you! With wet underfloor heating systems workmanship is key. Leaks arise most often through poor workmanship issues. Make sure all sealing rings are installed complete and undamaged, and that pipe cutting is accurate and cut at right angles with any joints correctly made. Current Building Regulations have particular requirements relating to insulation above, below and of any pipe runs for Underfloor Heating Systems. Be sure to consult with your Building Control Inspector, whether Local Authority or Approved Inspector, when the time comes to lay the network to avoid a contravention of Building Regulations. Often claims occur because there has been inadequate testing and commissioning. On completion of the work and before any expensive finishes are applied it is essential that you make sure that there is adequate pressure testing of the whole system. Prevention is always better than cure – so with that in mind it is always easier and cheaper to rectify any problems whilst the relevant trades are still on site and before final finishes go on. 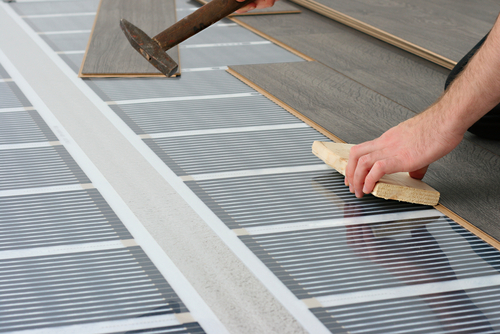 Bear in mind that once the underfloor heating system has been installed and before the final finishes are applied, you will undoubtedly still have other work to be completed by other Trades. Therefore, make sure that the pipe runs and cabling are fully protected to prevent the Trades following on from stepping or dropping tools or other items on them…….. This is a common problem and sets up the potential for hidden damage which becomes evident much later and which will be expensive to put right. Also before the floor screed has been laid, make sure that there are comprehensive and accurate drawings done so that that the follow trades know where all the pipe and cable runs are so that they can avoid inadvertently damaging it. Once you have completed your build and have moved in there are still things which can go wrong with underfloor heating (particularly wet systems) such as gradual leaks caused by wear and tear rather than poor workmanship. This can cause substantial damage to your home and contents. Remember escape of water from pipes and any consequential damage is unlikely to be covered by a Structural Warranty Insurance Policy. Therefore you are looking to your Home Insurance – but this will generally cover the cost of repair to the damage caused by a leak and may not cover the cost of finding the source of the leak, leaving the homeowner to foot the bill for finding the leaking pipe and repairing it and then reinstating the fabric of the home. Check your Home Policy to make sure you have ‘Trace and Access’ cover because if a leak occurs in your underfloor heating system then removing and reinstating floor coverings and floorboards can be expensive, particularly if it includes expensive tiled or marble floors, say, in ‘wet rooms’. Also make sure the amount of cover is adequate bearing in mind the average claim for Underfloor Heating Systems is believed to be in excess of £40,000 ! Peter Richardson is a Director of Sennocke International Insurance Services Limited, the company behind Self-Build Zone and Build-Zone which has been providing Insurance solutions to self-builders for over 15 years. ‹ What’s the best heating system to comply with ROI energy regulations?